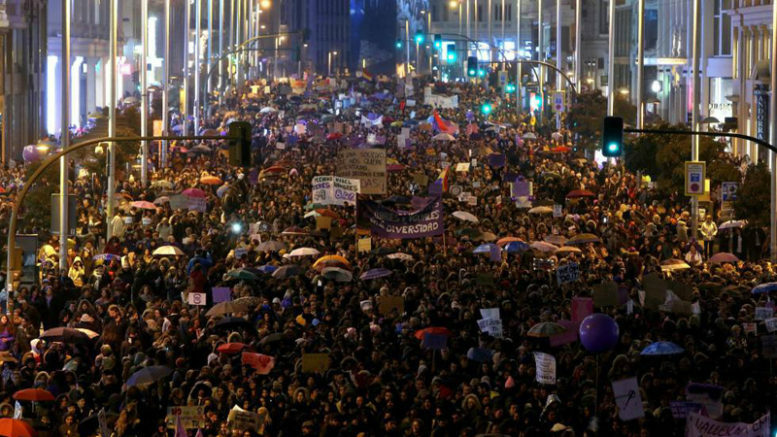 Leftwing opposition parties and leading feminist associations have charged the governing Partido Popular (PP) of President Marian Rajoy with abandoning Spain’s National Pact Against Gender Violence (Pacto nacional contra la Violencia de Género), after the government unveiled a new 2018 federal budget proposal showing a sharp cut in its previous commitment to earmark 200 million euros this year to combat violence against women. On Tuesday, Finance Minister Cristobal Montoro presented the government’s 2018 budget proposal showing only 80 million euros earmarked to to combat violence against women, leaving the remaining 120 million to optional expenditures from the general budgets of those regional and municipal governments that choose to spend money to fight gender violence. The Socialist party (PSOE) says the government’s new budget figures show “total noncompliance” with its prior commitment under the national Pacto, subscribed by the PP in July 2017 along with all other political parties in Congress. Ángeles Álvarez, the PSOE’s Equality spokesperson in Congress, said that under the terms of that accord the government should have presented a 2018 budget as agreed with 200 million in direct federal expenditures to combat violence against women. Sofía Castañón, the Equality spokesperson for Podemos in Congress, noted that the 80 million euros earmarked in the 2018 budget proposal is even less than the money spent by the government to combat gender violence in 2008 or 2009, as Spain’s economic crisis was beginning to lead to sharp austerity cuts in the federal budget. Yolanda Besteiro, the president of Spain’s Federación de Mujeres Progresistas (FMP, Federation of Progressive Women), said her organization was “perplexed” and “very disappointed” by the government’s decision to cut back on its prior commitment. Under the agreed-upon terms of the Pacto, the Rajoy government was to spend 1 billion euros over a five-year period beginning in 2018, with 200 million euros earmarked each year to implement more than 200 measures aimed at curbing violence against women and providing counseling and support nationwide to victims of gender violence. Under pressure from opposition parties in Congress to begin releasing the funding, in November Rajoy had pledged to sign legislation implementing the all-party Pacto and to free up the first tranche of 200 million euros by the end of 2017.